This is one those posts that has many levels and many topics to discuss! The story began back in late December 2017. Exactly 22 days after moving into The Granary in Dunwich we sadly lost our much loved family dog, Millie. As a super fit 10 year old Border Terrier X Springer Spaniel, Millie was always seen out and about in the village running with me, she had so much energy it was ridiculous and none of us saw what happened coming. I was in the house when Millie started having a massive seizure in the living room. It was actually quite terrifying as I was unable to do anything to help her, I simply had to wait for her seizure to come to an end. When she finally did come round she was unable to get up and half of her body/face was ‘slouched’ and limp. We got her to the vets pronto where they suspected a possible brain tumour resulting in a stroke like seizure. Whilst we were at the vets Millie had a further two seizures and we took the heartbreaking decision to have Mille put to sleep. I will never forget the look on my poor dogs face after she had her seizures; quite simply our beloved, bouncy family dog had had enough. It was time. As you can imagine there were a fair few tears but we took Millie home and her final resting place is in a lovely south facing spot in the garden. Fast forward two months and we were finally ready as a family to potentially broach the subject of getting another dog. Living in such a beautiful spot on the Suffolk Coast we felt that it was a waste not having another dog to take on walks in the forest/beach and quite frankly the house just felt empty. Always wanting to adopt over shopping for pets wherever possible our first port of call was the local rehoming centres. With the RSPCA having a centre not far from us in Martlesham we set out with a view to get one energetic, possibly puppy to start a new chapter with us in Dunwich. Needless to say we DID NOT end up with a puppy. Why we ended up with were three OAP dogs aged 10, 11 & 12 who were never going to run a 5k if you paid them a million doggie biscuits to do so! So how did we end up diverting so far away from our original set out plan I hear you ask? Well, we have a policy in our family, always have done and always will. If an animal enters our family, it never leaves. Whatever happens we work through it and that animal is here for life. Myself, Mum & Dad all went to rehoming centre looking for our ‘puppy’ but as soon as they mentioned the story of Lucy, Winnie & Mitzy who had ended up in the centre through no fault of their own we were sold. Hook line and sinker. 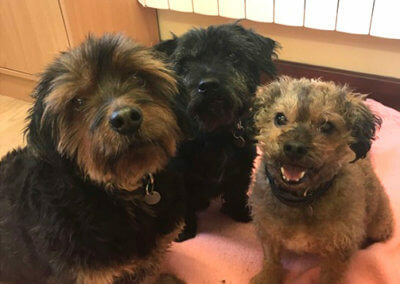 The trio had ended up at the centre in Martlesham as their elderly owners had both had to go into a retirement home at the same time and were unable to take them with them. With no family members able to take on three dogs at once the trio had ended up in the centre. 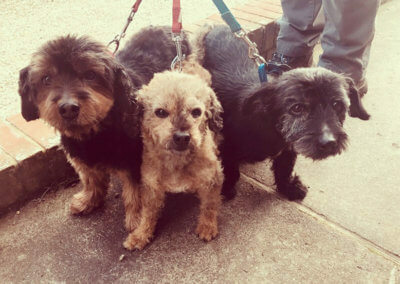 Unfortunately, because of their ages and because there were three of them no one had come forward to take on these three adorable dogs. The centre were trying desperately to not separate the girls as they had been together since they were puppies and very much did everything together. A really nice little thought is that they had put a date on when they were going to have to split the girls up to try and get them re-homed. This was the day us three muppets turned up! Dad was sceptical, and to this day he claims he was forced into having them – let me tell you the truth. At the point wherein they mentioned splitting up Lucy, Mitzy & Winnie my Dad turned round to us and the RSPCA inspector and simply said, “well we’ll have to take all three then won’t we?” He’ll claim otherwise but this is what happened! 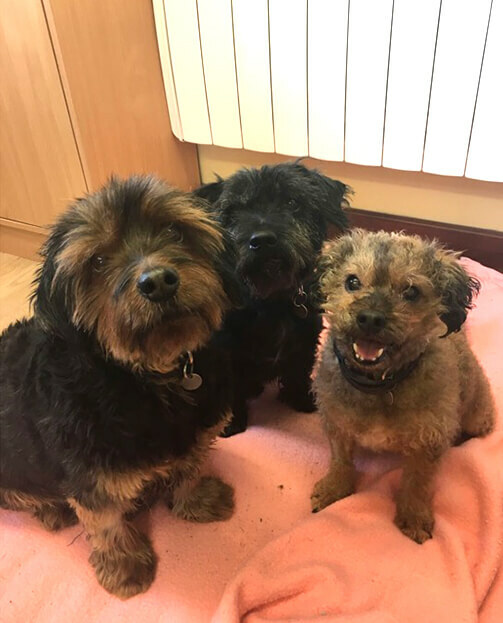 We had our house inspection and the date was set for the trio to come to their new home, we were set back slightly by the ‘Beast from the East’ but in the interim we suddenly discovered that these tiny (Winnie weighs a mere 6kg) OAP dogs were real life dog celebrities! In an attempt to re home them the RSPCA had been in touch with the local newspaper who had run an article trying to get them re homed. The story had also gone ‘viral’ with many pet bloggers across the world had spread the story. Since we’ve had the dogs we’ve had people from as far as America asking how they are getting on! On the day we went to pick them up Dad and I were faced with a reporter and cameraman from the East Anglian Daily Times and we subsequently ended up on the front page of the newspaper (see article) and I was interviewed on BBC Radio Suffolk on the Saturday morning Breakfast show! It all got extraordinarily out of hand in such a brilliant way with Lucy, Winnie & Mitzy being an internet sensation. 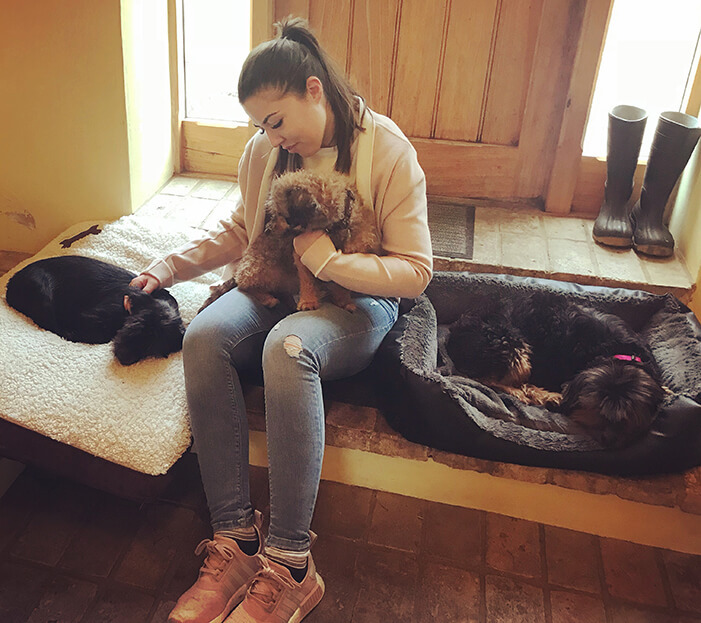 It has been a solid 6 months now since we re homed the girls and we still get customers in the Tearooms and people from the local area stopping us to ask how the dogs are getting on! 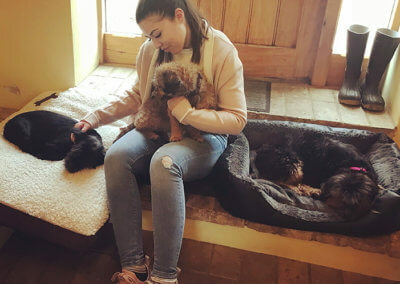 The daughter of the elderly couple heard about the story in the newspaper and came to visit us at the Tearooms and holiday cottages and I feel great knowing that the original owners now know that their beloved pooches are safe and will be in a loving home for their twilight years. With their ‘local celebrity’ status Lucy, Winnie & Mitzy are very much enjoying all their new found fame and seem to spend most of their time lounging around in their baskets after going on their many walks in the forest. It’s been a slight adjustment for us all; we have always had energetic dogs who would walk/run all day and I’m pretty sure the girls had never walked on anything other than a pavement before they came to us. Let’s just ay that I don’t think they’ve ever been as fit as they are right now!